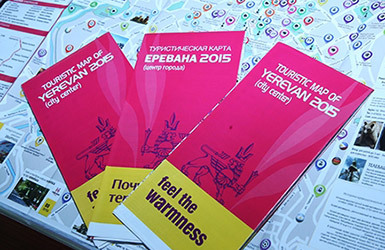 The tourist map of Yerevan presented by Tourism Union of Municipality on June 2015 printed in two languages: English and Russian, consists of the information about the main places of interest in Yerevan center, information about museums working-time, prices, historical and cultural monuments, etc. The map also includes the information about Yerevan Metro, bicycle stops in the city center, useful information of web-sites necessary for tourists, hotlines for tourists. The guidebook contains information about the historical and cultural monuments, museums, theaters, concert-halls, hotels, streets and attractions, as well as the visa regime, national peculiarities, restaurants, cafes, shops and other sightseeing locations. This unique guidebook with photos for youth has a slogan "A city with flair". In the guidebook youth and entertainment centers, museums restaurants, cafes, bars, night clubs and attractions are represented. Besides the impressive photos there are interesting comments which describe the city special for young people. 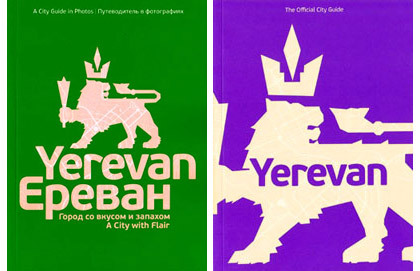 The guidebooks can be purchased in bookstores, hotels and tourist-houses of Yerevan.